Some of my thoughts today. My siblings are on my thoughts lately, what are they doing, how are they, what are they feeling, where have they travelled to and so much more. I have come to realize that family is something that should not be taken granted for. I see so many young people today that seem lost, like they don’t have a purpose and this concerns me. I know that growing up in today’s technological age is somewhat overwhelming even for me sometimes, I can’t even imagine how intertwined it is for our young people. They have cell phones at the disposal, wifi in their homes, satellite tv, smart TV’s, thousands of apps on their cells, kitchen appliances that calculate & have features galore, vehicles that practically drive themselves, home alarm systems, gardens that water themselves, debit/credit cards, computers with 1 terabyte, live streaming, OMG the list is endless. No wonder our young people are confused and distracted from what’s most important and to me that is FAMILY. How do parents parent in 2016? Is knowing your family history as important as it was 20 years ago? Learning how we are related to one another and introducing each others and referencing our family status is a vital part of knowing who we are and how we belong. When I introduce my daughters to some one that is related, even by 3 generations, is so important. This is your grandmother, your grandmothers younger sister or this is your auntie, your dads first cousin older sister. I want my daughters and my grandchildren to know where they belong and how they belong. That learning has to come from family and cannot be found on a cell phone. I want my daughters to know that their great great great grandfather was Chief Joseph of the Nez Perce Nation. We come from a rich vibrant culture that needs to be shared and taught from those who know, from our grandmothers & grandfathers, our aunties & uncles, and from all our descendant’s who have move to spirit world. Knowing my relations is what keeps me connected, feeling that I am a part of a whole, the bigger picture. I strongly believe that knowing where you come from gives you that feeling of being connected and that you belong. You have a place. As I sit and watch our younger generation at the mall, I see them sitting and looking down at their cell phones. They barely look up at each other or even look around. It’s 10:30 in the morning, should they not be in school? So many thoughts run through my head. Then I thought about the boy who has nothing to eat because his mother is in a bad way. Addiction is a whole another inner battle. When I was growing up, I had chores to do. During the winter I would have to go outside with gunny sacks and find a fresh area of snow and fill up my gunny sacks with snow. My mom would then melt the snow to use for cooking, washing, and cleaning. I would have to go down to the creek to open up the watering hole for the cows and on my way back toss hay over the fence for the cows to eat when they returned from the creek, all before I walked 1 km to the road to catch the bus at 7:00am. When I returned home after school, I would have to chop wood for the wood stove, help with household chores and make sure the lanterns were ready and filled. All this work was ensure we would be warm, have some light and be able to cook. What I do today, is walk down the hallway and turn up the furnace to stay warm, flip a switch to have light and turn a knob on the stove to eat. We received power in 1974 and it was amazing and I remember when we got a stove and a fridge. Holy man that was something. I can’t even imagine what could be so amazing as electricity today. Probably nothing. It’s seems it’s all been done and even though something came out last week, this week it’s old. If I did not grow up when I did, I would not know how vital my role was within my family. It gave me that feeling of belonging and that what my chores meant to our survival. Today, I still carry on with my vegetable and raspberry garden, canning in the fall to have fresh vegetables and fruit in the winter, hanging my clothes out on the cloths line in the summer to conserve on power, lighting candles in the evening in remembrance and praying morning and night. Yes indeed, it so different today than it was back 45 years ago. Anyway, those were my thoughts last night and felt like sharing with you all. I have a friend, who I shall call Saphie, made her first time trip to Sephora last month. I was sad that I was not able to make the trip with her, however the ladies at Sephora, West Edmonton Mall, Edmonton, made her feel right at home. Saphie raved about all the information that she received and was amazed at all the products that were available. As someone relatively new to the cosmetic world, Saphie was thankful that the staff were very patient and knowledgeable during her time there. Saphie received a complete makeover and tutorial and purchased the products that were used create the beautiful look that she wore that evening. She was absolutely glowing and I was simply in aawwwh of how beautiful she looked. Of course, I was anxious to hear about her experience and most of all, wanted to know what her haul consisted of. When I finally had the opportunity to see what she purchased, I was indeed very happy with her products and in my opinion is a fantastic first time starter kit. The following is a list of the products she came home with: 1. Too Faced Sunny Bunny Natural Bronzer & Insurance Eyeshadow Primer 2. 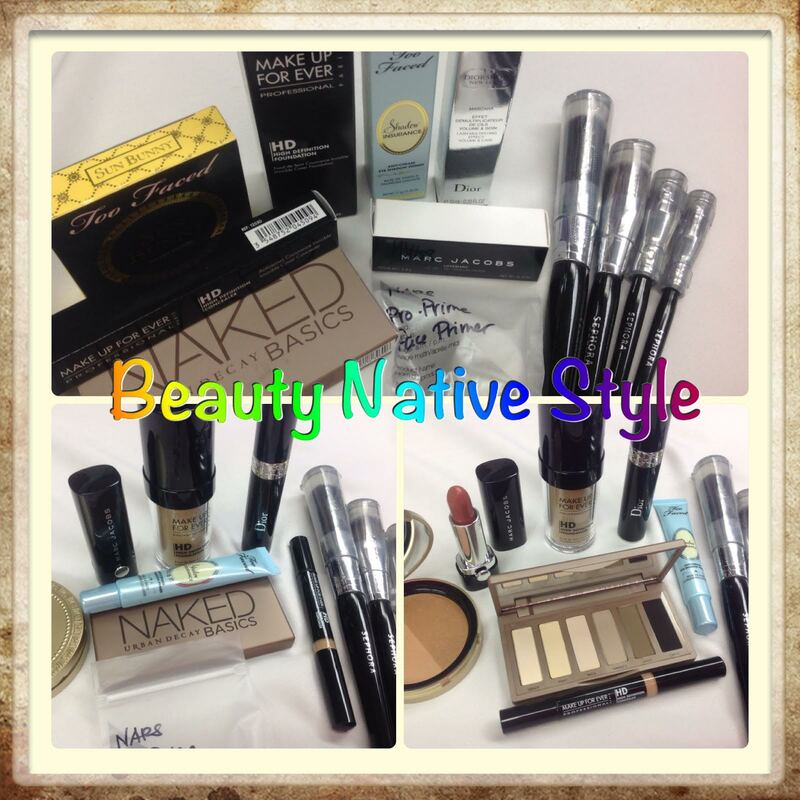 Makeup For Ever Professional High Definition Foundation & Concealer 3. Dior Mascara 4. Marc Jacobs Lovemarc Lip Gel in Understudy 114 5. Urban Decay Naked Basics 6. Sample, NARS Pro Face Primer 7. 4 Sephora Brushes. To all you ladies new to makeup, you are in for an amazing world of beauty. Good Job going out to my friend Saphie. The moment that I realized that Sephora’s was tailored to my every beauty product whim was the day I realized that I’m going to have to be very creative when it came to revealing the contents of what lies within the smallish box, to my husband. I recall how excited I was when I got the notice in the mail last week, that read ‘YOU HAVE A PARCEL FOR PICK UP”. Well for pete sakes, I could not keep my stupid looking smiling grin off my face for two seconds. I guess it’s the same way children get when their told, Ok, go choose one toy, and their lil eyes widen and their smiling grin appears in absolute joy. Well that was me. So the next day, I’m with my husband and I say, I have to stop and pick up a parcel at the Post Office, sounding very unenthusiastic but inside I was bursting at the seams. I go in, get my parcel and as I’m leaving the Post Office, I meet a few ladies and were Owwwing and Awwwing over my Parcel and for a moment we let our imaginations get the better of us and we all burst out laughing. As I continue out to the vehicle, I carry the smallish box with the up most care as if inside was a painting by Bev Doolittle. I place the package down and start sifting through our mail and he says, so what’s in the box, but I think he has come to recognize the smallish box and it’s markings and I say very uninterested, ” oh probably that order I placed looooong ago that I totally forgot about”. I’m sure he’s on to me because he keeps asking me questions about the smallish box and I say OK OK lets find out. I proceed to open the smallish box and reveal the products that I purchased online just days ago and he says, more makeup? I totally gasp at him and say, hey don’t you have enough tools, while I tap my foot. After a moment of silence we start laughing and only then can I begin to unleash my silly grin as I go through the contents of the smallish box. I mean really, men and tools, woman and their makeup or shoes or purses, I could go on but I won’t, it’s the same. So, ladies there you have it and if you have not figured this one out yet, well let me let you, it works. A man loves his tools and sports or whatever else and that I tell you is valuable information.